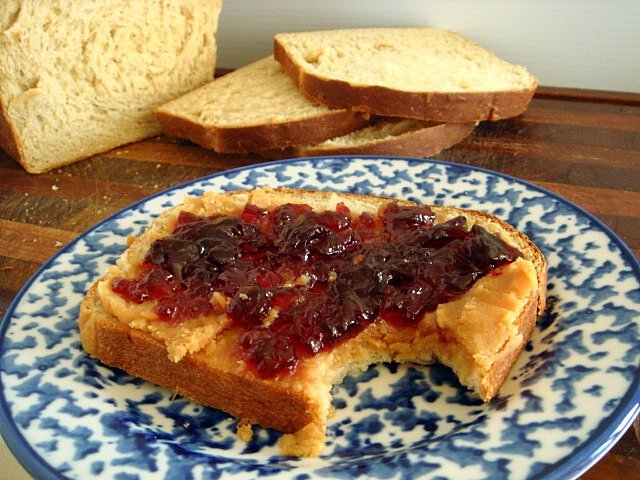 In case you were not aware, National Peanut Butter & Jelly Day is coming up on April 2. To celebrate, I have partnered with my new blog buddy Cindy, from Once Upon A Loaf, to bring to you Project PB&J. We've invited bloggers to participate by creating a recipe that pays homage to the classic sandwich that is much beloved by many. 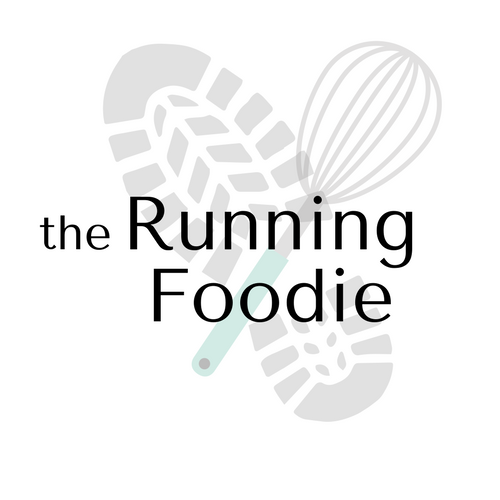 Starting next week, you can expect to see the bloggers' PB&J-inspired recipes. We'll be posting link ups, so check our blogs to stay up to date. What does this have to do with Red Star Yeast? They are one of the sponsors of Project PB&J. To show our thanks to the at the enthusiasm of the companies who are supporting us in our endeavor, Cindy and I are giving a shout out to them by making their recipes, or creating recipes from their products, like the Peanut Butter Banana Bread with Doug's Nuts I posted last week. So why did I decide to make a loaf of bread? Because bread makes or breaks a sandwich, and good bread goes a long way in making a sandwich a pleasant eating experience. 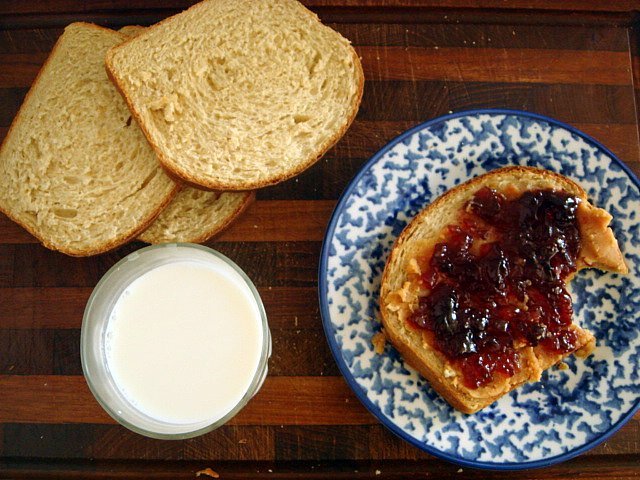 Peanut butter and jelly on dry, store-bought bread? No, thank you. Cindy passed along a few recipes provided by Red Star Yeast. Their Old Fashioned Buttermilk White Bread stood out to me, and it just so happened that I had a carton of buttermilk in the fridge. I've never made a yeast bread with buttermilk so I was looking forward to tasting the results. I changed the recipe a little by replacing half the bread flour with white whole wheat to add a little more nutrition to the loaf. I also made it by hand. Kneading dough is pretty relaxing and is more fun than push ups, and I recommend it as a workout if you can't get to the therapist or the gym. The Red Star Yeast instructions say to mix the yeast with the flour, but I opted to proof it first as I usually do, so I mixed it with half of the heated water and buttermilk, and a bit of sugar. Like I mentioned above, I used white whole wheat flour. It's much lighter in texture than traditional whole wheat and gives the bread a nice complexity without being noticeable on its own. If you want a heartier whole wheat taste, use regular whole wheat flour. To the flour, I added a tablespoon of vital wheat gluten. I add it to almost every bread I make except for artisan loaves. 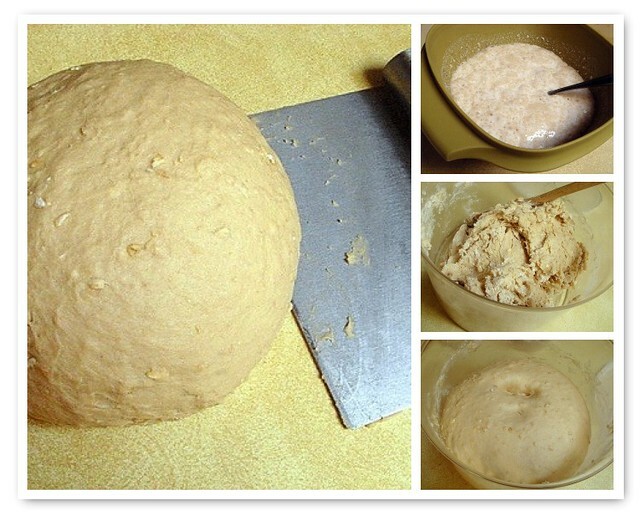 It contributes to the dough's texture and rise, and keeps it fresh longer. The dough seemed a little dry once I mixed the liquids into the flour, but it kneaded up into a smooth dough and I didn't even need to add any extra flour. After that, I let it rise until an indent pressed into the dough remained. When it comes to rolling the dough into a loaf, I've created my own method after countless number of loaves baked up with gaps. 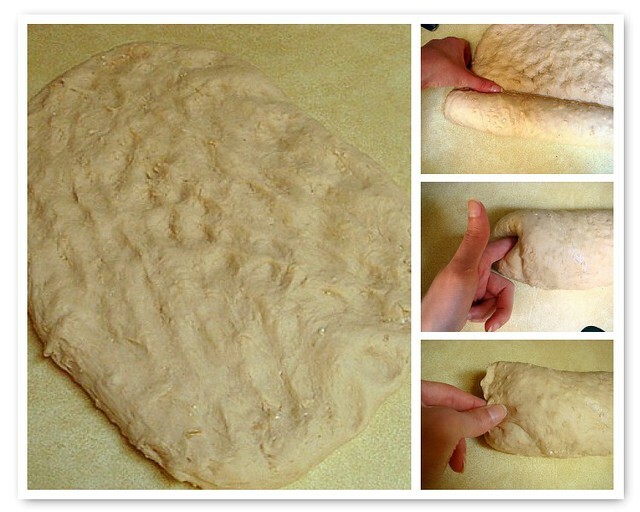 In the large picture (and continuing clockwise), press the dough out into a rectangle, with the long side facing you, and dimple the top with your fingers. Next, pinch the dough after each roll. I've found that this prevents gaps from occurring. Once the dough is rolled up, press your finger into either end of the loaf until it meets the final turn of the roll (does that even make any sense? ), and pinch shut. 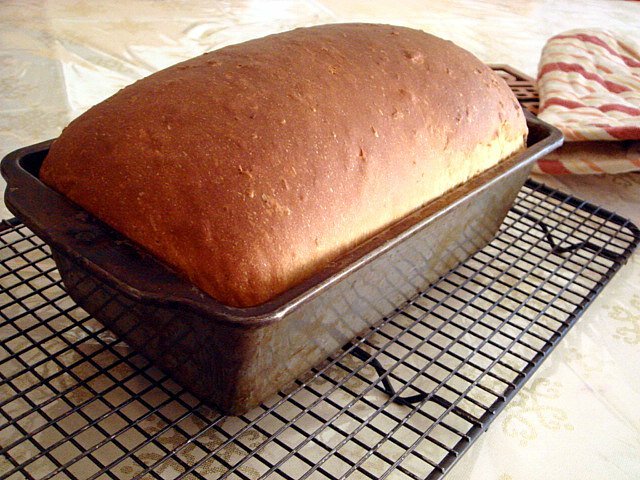 Place the loaf inside a prepared bread pan, cover, walk away, and let the dough rise until it's higher than the sides of the pan. I love it when bread turns out right, and this loaf definitely turned out right. It had a nice, high rise and a lovely brown crust. I couldn't wait to slice into it, but I managed to keep away for an hour to give the bread a chance to cool. 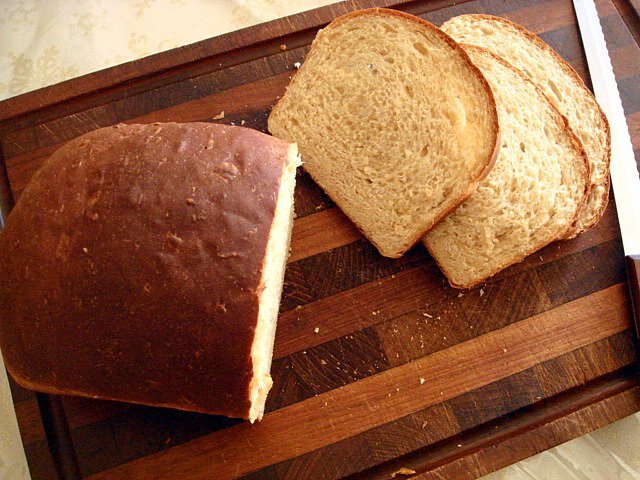 If you slice it too early, the bread will be gummy and more difficult to slice. How did I feel about the taste of the buttermilk? It definitely had a strong tanginess to it, quite different from sourdough, but it wasn't bad at all. I mean, I ate a couple of slices. I will probably decrease the buttermilk next time, though, because I like my bread to be a little more mild in terms of flavor. On the plus side, the texture of the crumb was incredible - very moist and tender, almost buttery and melt-in-your-mouth. A perfect platform for peanut butter and jelly. Heat water and buttermilk to 110°. In a small bowl, place yeast and 1/4 teaspoon sugar. Add half the heated buttermilk mixture and stir to combine. Let stand until proofed, about 5 minutes. 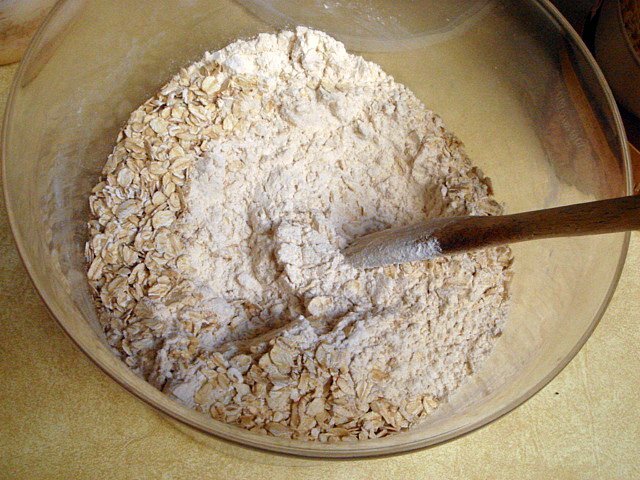 In a large mixing bowl, combine the flours, oatmeal, wheat gluten, remaining sugar, and salt. Make a well in the center of the flour; pour in the proofed yeast mixture along with the remaining buttermilk and the oil. Stir to form a shaggy dough. Turn dough out onto a counter, dusting lightly with flour if necessary, and knead for ten minutes or until dough is smooth and elastic. A pastry scraper helps. Form dough into a ball and place into mixing bowl. 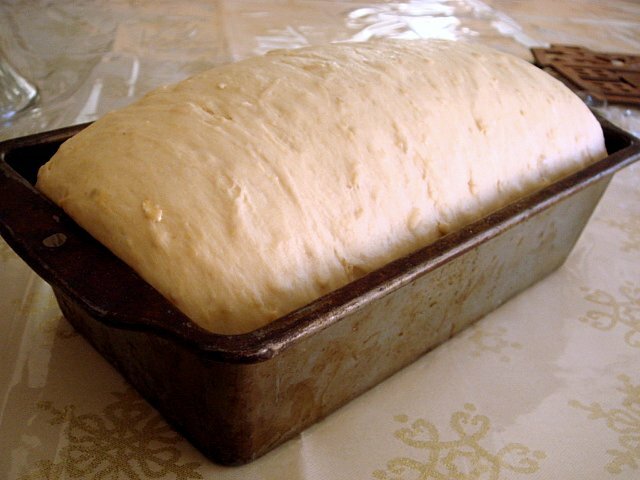 Cover with a damp cloth or plastic wrap and let rise until and indent remains in dough when pressed, about 1-2 hours. Punch risen dough down and turn out onto the counter. Patt into a rectangle, dimpling top with fingers. Roll short side up, pinching to create a seam after each roll. Pinch seam shut; press a finger into both ends of the roll, then pinch sides shut. 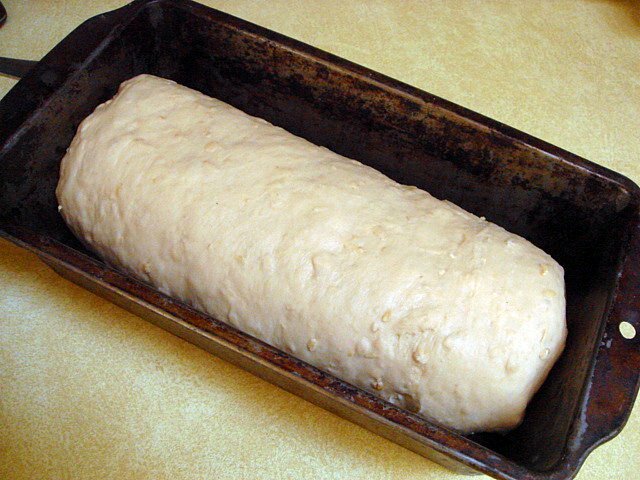 Place in a greased 9x5-inch bread pan; cover with damp cloth or plastic wrap and let rise until dough expands over sides, about 1-2 hours. During last 15 minutes of rising time, preheat oven to 375°. Bake loaf for 35-40 minutes, or until crust has browned and loaf sounds hollow when underside is tapped. Remove loaf from pan and let cool on a wire rack.